I’d thought I’d get my new purchases in the grown this weekend and I managed to do this! Usually, I have them standing around in their seed bags or seedling trays for a week or two (some are STILL in their bag) - not good! I humm and haaaaa to see where I should plant them. But this time - when Christine and I went shopping to the “just one bag of compost” nursery – I already had a place in my garden that needed filling. So they went straight in!! And I have now learnt a valuable lesson. Shop when you have a place in mind. This prevents the stress on the plant and it can immediately relate to its new home and plant friends! Let’s see how they do in their new home! 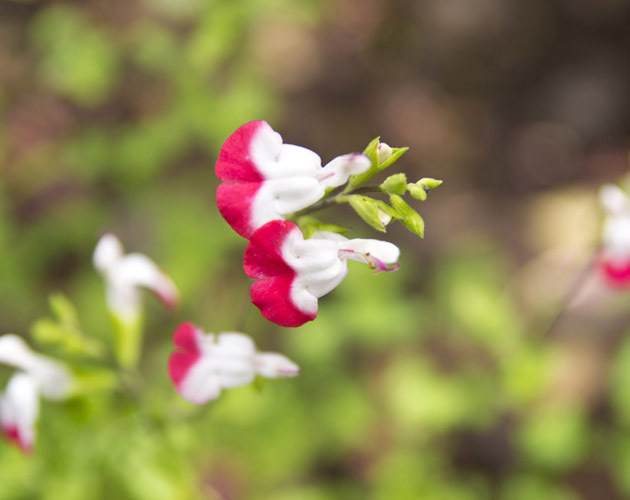 Salvia microphylla ‘Hot Lips’ was found near the Chiapas area of Mexico and was introduced by Richard Turner of the Strybing Arboretum in San Francisco, California. This is a unique bi-color salvia that has red tips and white lips. In the hotter months of summer it may have all red and all white flowers on the same plant due to warmer night temperatures, but when the night temperature drops in the fall the flowers will return to their bi-color state. This Salvia has a similar look to Salvia greggii except it has a finer texture and smaller leaf. Hot Lips Sage seems not to have some of the leaf spot and defoliation problems that you can get with the greggii’s during high humidity situations, great for use in borders and beds. Salvia microphylla ‘Hot Lips’ can reach 30″ tall and spread up to 6′ at maturity. This is a Hardy plant – Full sun with low watering requirements. Calibrachoa is a genus of plants in the Solanaceae (nightshade) family. They are weak evergreen short-lived perennials and subshrubs with a sprawling habit, and they have small petunia-type flowers. They are found across much the same region of South America as petunias, from southern Brazil across to Peru and Chile. Calibrachoa are closely related to the petunia. However on further examination it has been found that there are major differences in chromosomes, corresponding to external differences and fertilization factors that distinguished Calibrachoa from the petunias. Calibrachoa is named after Antonio de la Cal y Bracho, a 19th century Mexican botanist and pharmacologist. Look how lovely they fit in my garden. Barbie, I was so entranced by your ‘Hot Lips’, that I looked up more information about this beautiful plant. Sadly, Salvia microphylla will not survive our USDA Zone-5 climate. I will be forced to admire this stunner from afar. Gorgeous! A truly delicate salvia – they are very feminine plants. 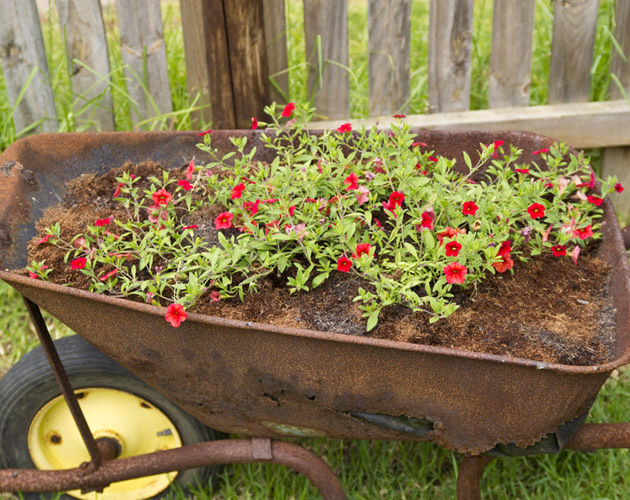 Your rusting wheelbarrow makes me go weak with envy. What a beautiful Salvia! Oh, and I love the wheelbarrow planting. You are so creative! Thank you I’ve always wanted to have an old rusty wheelbarrow (but never owned one!) Now I do and it looks great! For constant color and ease of growing, the Calibrachoa is hard to beat for an annual here. That wheelbarrow will not be seen very shortly because this is such a fast growing and prolific bloomer. This is a cute display too. Thanks Donna – Just what I wanted to achieve! Whenever I see a new plant that I must have, I try to imagine where I can put it in my garden. If I can think of no place – no place at all – I don’t buy it (most of the time). Two great plants here. I especially love Hot LIps! Impulse buys are fun though! I like to allow myself an “impulse” buy every once in a while. I usually do a small amount of research on my phone before I put an unfamiliar plant into my shopping cart though. Does Calibrachoa attract bees or other pollinators? Petunias to me seem too “sterile” for my garden, as the plantings I see don’t have any wildlife around them. Yes, you’re right!! Impulse purchasing is always therapeutic! I’m not sure about the calibrachoa – I will keep my eyes on them. I also prefer the bug-hugging plants! I agree about buying plants for a specific spot – much easier than impulse buying! Love the hot lips, SOOO cute! Thanks so much – I’m loving my hot lips!